At Put This On, we know quality, interesting clothing is expensive, and since our founding, we’ve endorsed vintage and secondhand as important style resources. Not only for guys just getting into style, who often are on tight budgets and need to try some different styles out before finding what works for their personalities and lives, but for everyone interested in cultivating their style. In the past, thrift stores were in my regular rotation for this sort of shopping: good stuff, really cheap, the cost coming mostly in time spent browsing. But the vein of rad stuff at true *thrift* stores is far weaker than it was even a decade ago. Some of this is overfishing, as more people know what’s the “good stuff.” It either never makes it to the thrift store or is picked up by collectors/ dealers before a casual thrifter can grab it. Another factor is that thrift store stock represents a snapshot in time of mass-market clothing, going back 15-20 years, and the most recent 15-20 years was just not a terrific time for interesting, quality mass-market clothing. The shittiness of men’s style in the 2000s is one of the reasons sites like Put This On emerged. My opinion is admittedly a little biased by the same nostalgia cycles that make certain clothing and culture worth revisiting and re-evaluating (and deemed cool in retrospect). That cycle requires stuff to seem lame, and just plain dated, for a while. Fortunately, of course, a lot of good stuff that may once have languished on the rack at a thrift shop now ends up in the internet’s rummage sale with a search engine: eBay. I still search eBay all the time (in part to help put together our twice weekly eBay roundups) and find a lot of good vintage (so, 20+ years old), as well as recent, secondhand clothing that’s either a bargain or rare. Ebay doesn’t publish changes in the size of its marketplace, but the company’s revenue has increased in all but one year since 2013. But in the clothing market, at least, eBay has seen more and more competition. Over the last few years, other secondhand and consignment sites have emerged that are worth shopping. Etsy is chock full of handmade tchotckes, but also has a good selection of vintage, and you don’t have to deal with the auction system. Grailed is probably the one I use most, but I also often browse sites such as The Real Real, Vestiaire Collective, Marrkt, and Drop93, as well as the ever-present Styleforum marketplace. I’ve discussed some of these sites before from a seller’s perspective — some are marketplaces that just host your ad, others are consignment services — but let’s be honest, I’m more often shopping than selling. …your best bets are likely still eBay and Etsy. These markets are very mature with thousands of reputable sellers and new daily listings for interesting stuff. As a buyer, you take on some risk in that most sellers don’t take returns and are not necessarily adept at taking photos or garment measurements. But that’s part of the fun, and the way that these markets most closely resemble the gamble of thrifting. You can still happen upon a blurry listing for a perfect 1960s OCBD for $20. 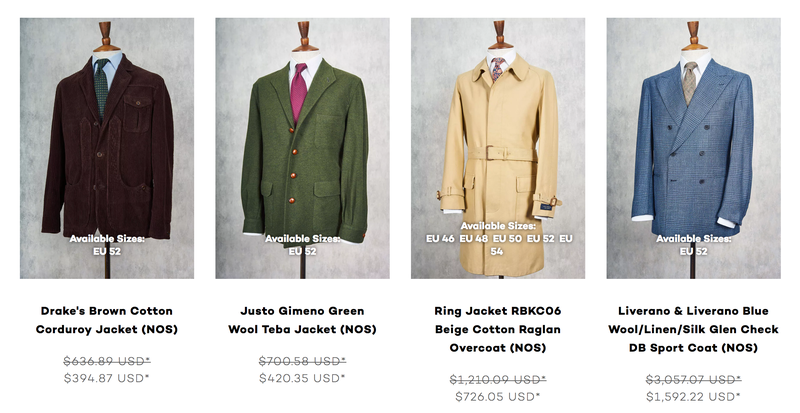 Ebay is also still likely the best (cheapeast, broadest) online source for secondhand tailoring and more classic, formal men’s clothing, whether it’s Ivy Style jackets or Italian suits. The buyers and sellers for this sort of clothing have been on eBay for over a decade. The long-standing caveat emptors stand: you can’t just search for reputable names; you need to be savvy regarding cuts and conditions to get value. A lot of great brands have made suits with bulky and extended shoulders, or other details that quickly reveal a suits age: low or close-together buttons, lapels that are too narrow or too broad, etc. If you’re an eBay vet, this is pretty obvious, but set up saved searches for the types of things you’re looking for (or check our roundups!). If you are looking for deals on things there might be competition for, check in often and sort your results by most recent. That way, if a seller lists something with an unnaturally low price, you’re more likely to catch it. And don’t forget to sign up for the eBay Bucks Rewards Program. It’s an easy way to get between 6% t0 20% back on your purchase in the form of eBay store credit (which can be used on future eBay purchases). …this is where the smaller markets come in. Grailed took the secondary menswear market by storm with an easy-to-use, visual-heavy interface: essentially an endless scroll of user-listed pieces. It’s a competitive market for “hype” items: limited and designer sneakers, and brands such as Supreme, where you may pay over retail but at least get access to items with narrow retail distribution. It’s a solid secondhand market for what I might call the post-Superfuture tier — obscure streetwear brands from Japan (e.g., Wacko Maria and Wtaps), contemporary men’s designers with some name recognition, and “grails” — stuff from defunct brands or past designer collections, such as Nom de Guerre or old Raf Simons. A couple of years ago, the tech was good but the marketplace a little bare, maybe. At this point, there are listings going up, it seems, by the second. There’s not a lot of traffic for tailored or formal men’s clothing, but on the other hand, there can be good deals on the limited stock in that area. Set up saved filters based on your interests. 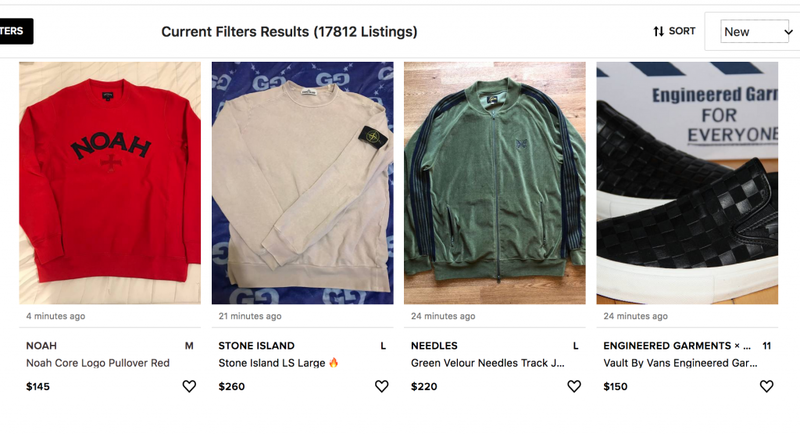 If you’re just browsing, sort by most recent; Grailed’s algorithm may otherwise push popular items. Due to Grailed’s “offer” system, list prices can be a little inflated. In my experience as a buyer and seller, people expect a degree of negotiating. This consignment site (registration required) has grown quickly since its founding in 2011. A few years ago, I didn’t see much there, but I’ve recently bought secondhand shirts and jackets from Drake’s and a pair of Visvim shoes. TRR specializes in luxury brands — the name intends to convey their confidence in the authenticity of the stock — and they recently told Marketplace their top three brands were Gucci, Louis Vuitton, and Chanel. But the stock is broad — you’ll find Gaziano and Girling shoes, a lot of Ralph Lauren, and occasionally Kapital. One weakness I’ve found in the market is size listing and descriptions. It’s great that the site bothers with taking measurements, but sometimes they don’t seem to add up. I’ve found jackets listed as XL with 42-inch chest measurements, for example. Of course, brands vary in how they size, and in my experiences, TRR’s measurements have been accurate. Like many other sites, it’s easiest to shop the Real Real by keeping a list of brands you know and like, and searching for new items from those brands. Searching for an item by type, such as a blue button front shirt, will usually return too many mediocre results. On the positive side, unlike most eBay and Grailed sellers, TRR accepts returns (unless an item is marked “final sale”). Marrkt is the consignment arm of Superdenim, and the stock reflects that connection — vintage-influenced, high-quality casualwear from brands such as The Real McCoys, Nigel Cabourn, and Orslow, plus occasional vintage milsurp or work gear. The prices are decent, and the site lists measurements and takes good photos. Since the site is in the UK, shipping can be a bit pricy to the US, and although the site accepts returns, the back and forth shipping cost is a little discouraging. Bonus for UK users though! VC lies somewhere between Grailed and The Real Real. The Paris-based site publishes user-generated listings and also accepts items for consignment. The company is more of a middle-man than Grailed or eBay, though. No matter what, you receive the item from VC rather than directly from the sellers. I’ve found the site especially good for European brands that don’t make it onto American secondhand markets as much; for example, JM Weston and Paraboot. The Armoury’s Drop93 came online in 2017 and has become a great source for the kind of menswear you associate with The Armoury — a selection drawing on Italian, American, and British tailoring styles, focusing on used and new old stock. Photos are terrific and extensive, and listings provide measurements and/ or sizing advice. Most used garments include measurements and the prices are good, considering this is a niche market and you don’t often see this stuff on sale. Far more often than these other sites, I’ll find myself planning purchases around Drop93’s stock. You can look for a suit in your size here and return solid results, whereas on sites that list mostly used tailoring, you’re always sort of guessing how much something’s been tailored from the tag size. 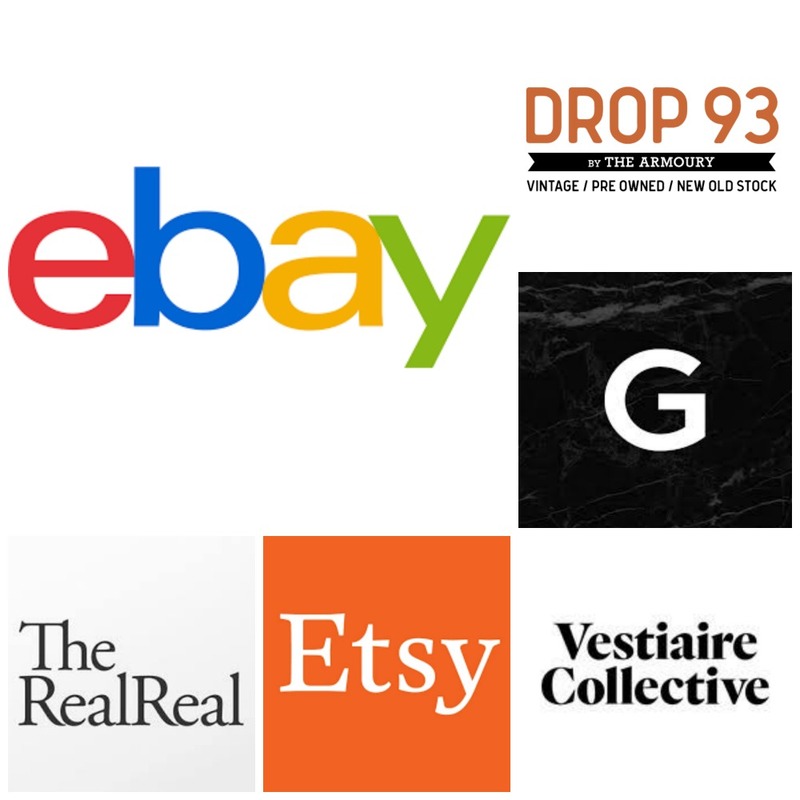 Drop93 accepts returns only on new old stock (and only for credit), not pre-owned or vintage items. On the plus side for U.S. shoppers, returns can be shipped to their U.S. address.